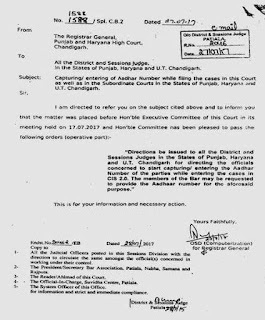 According to a communication issued by the Registrar General, the executive committee of the Punjab and Haryana High Court has directed all District and Sessions Judges in the States of Punjab, Haryana and Chandigarh to record Aadhaar numbers of the parties while entering the cases in Case Information System 2.0. The decision was made during a meeting held by the Executive Committee of the Court on 17 July, wherein it was held: “Directions be issued to all the District and Sessions Judges in the States of Punjab, Haryana and U.T. 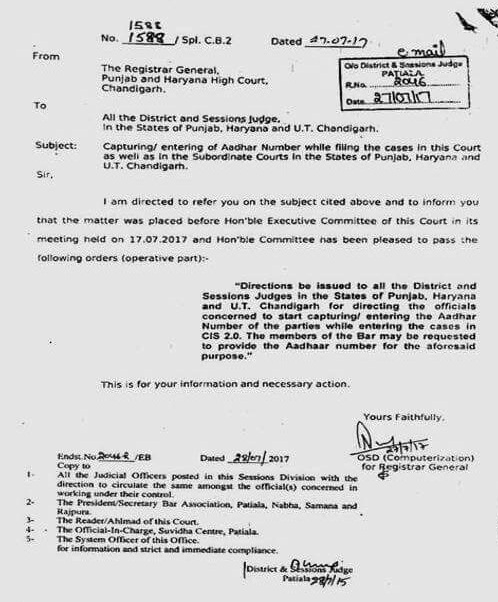 Chandigarh for directing the officials concerned to start capturing/ entering the Aadhaar Number of the parties while entering the cases in CIS 2.0. The members of the Bar may be requested to provide the Aadhaar number of the aforesaid purpose.” It is pertinent to note that earlier this month, the Supreme Court Registry had requested Advocates-On-Record(AORs) to register themselves on the new Website of Supreme Court of India for accessing the case management system and for availing various facilities available in the programme, including e-filing. While this system has a column for entering the Aadhaar number, the same is not mandatory.